The Italy Food Pantry received a very special donation on Monday of this week. 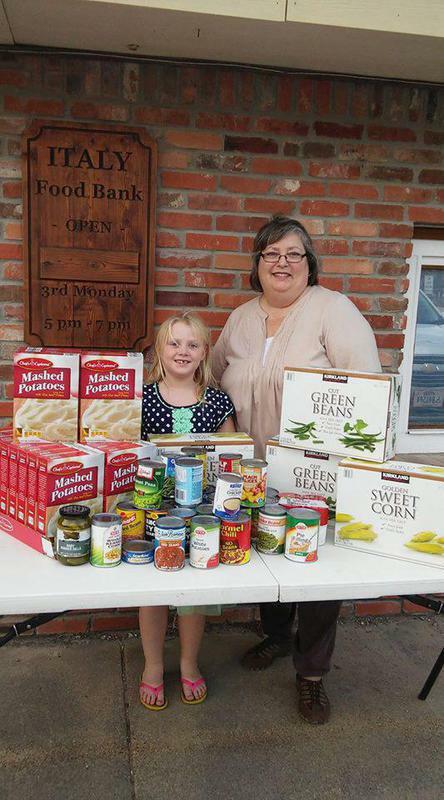 Annabelle Glover and her family delivered a table full of groceries to the local food pantry. Annabelle celebrated her 8th birthday with a party at the Lancaster Rec Center last weekend. Instead of birthday presents, she asked her friends that attended to bring canned goods for the pantry. None of the children came in empty handed. The local food pantry feeds 100 area families every month. Without the help of the pantry, many local residents including children would not have enough food to eat each month. Annabelle is a 2nd grader at Stafford Elementary in Italy. She loves to practice making u-tube videos. building things with her legos and playing softball. She is an 8 year old with a big heart and big dreams. Her biggest dream is to play softball for Texas A & M University.